It has been quite a busy weekend at home. As everybody in Sweden loves to go on holiday this time of the year, they all want to escape the dark and cold I think. We have a couple of extra dogs!!! Hm happy to see them go home again. Saturday I was on the Poodle Club meeting and my mother arrived later in the evening, we also had a mating here that was travelling 900 km one way by car. Hope they made it safe back home. On Sunday we had to change the door to the doghouse, we will refresh the whole doghouse in the spring summer and I am soo looking forward to that. I spend a lot of time there with the dogs, think I am there more than in the house. I don´t know what we should have done without Peters parents, Peters father helped Peter to change the door and everything, Peters mother is also helping out with laundry and other practical things in the house. Thank you! 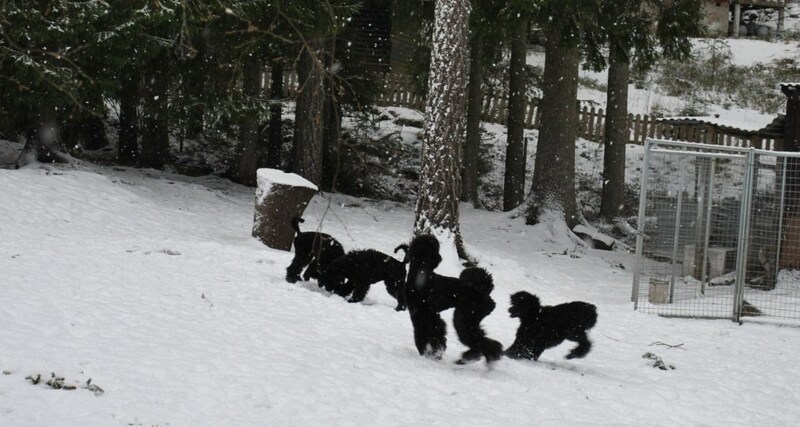 Here are some pictures of the puppies, Ami and Ganza that are playing in the snow yesterday. ← Do you want to work with Poodles?